Three men have accused former Syracuse University assistant basketball coach Bernie Fine of molesting them as children, but today a New York district attorney announced that he can't be prosecuted. Though he believes two of the accusers are credible, their claims weren't properly investigated when the came forward in 2002, and it wouldn't have mattered anyway because the statute of limitations had already expired. 39-year-old Bobby Davis and his stepbrother, 45-year-old Mike Lang, say that starting in the mid-'80s, Fine molested them hundred of times while they were serving as ball boys. In 2002, Davis went to police and several news outlets, and a few years later he told Syracuse University officials, but the allegations weren't brought to the attention of Onondaga County, New York, District Attorney William Fitzpatrick. The New York Times reports that in a press conference today, Fitzpatrick said that he regrets that he didn't learn of the case until recently because he believes the men are credible. 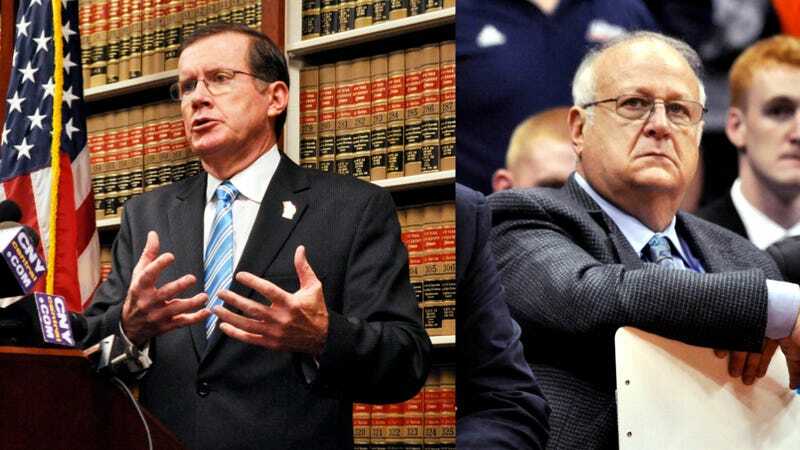 Fitzpatrick said, "It's not my place to say that Bernie Fine is guilty of anything. It is my place to say that the two victims are believable." Yet, even if Fitzpatrick was informed of the allegations in 2002, he still wouldn't have been able to charge Fine because New York has a five year statute of limitations for sexual assault or molestation. For childhood abuse, the five year count doesn't start until the child turns 18, but Davis and Lang were well past 23 when they came forward. There is another accuser who's currently 23, but Fitzpatrick discredited him in the press conference. Zach Tomaselli, who recently admitted to abusing a child himself, claims that Fine molested him in a hotel room after a 2002 game in Pittsburgh. However, Fitzpatrick says he found "exculpatory" records on the team's travel history that prove Tomaselli is lying, and he's given the information to Fine's attorneys. Federal authorities are still looking into Tomaselli's claims, and since they're not subject to the same statute of limitations, they could move forward with the case. The Syracuse Post-Standard notes that there have been reports of a fourth victim, but the D.A. says he's a repeat felony offender serving a life sentence in state prison and his claims aren't credible. Five years seems like an incredibly short statute of limitations, considering how long it sometimes takes abuse survivors to come to terms with what happened to them and report it. Thankfully, the case has already inspired New York legislators to consider extending the time limit on making sexual abuse charges. According to Reuters, one proposal would have the five-year statute of limitations begin when the victim turns 23, not 18. Bills have also been introduced that would make the five-year period begin when the crime is first reported, or extend the statute of limitations for the sexual abuse of children to 30 years. In the meantime, Fitzpatrick encouraging other people to come forward if they were abused by Fine. He said, "I can't bring Bernie Fine to justice for what he did to Bobby Davis and Mike Lang, but if any other victims come forward, those charges will be prosecuted to the fullest extent of the law."